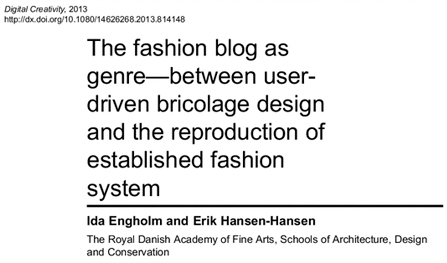 ‘The fashion blog as genre — between user-driven bricolage design and the reproduction of established fashion system’ is an academic article by Ida Engholm and Erik Hansen-Hansen published in Digital Creativity by Taylor & Francis. Link to article. Fashion as a phenomenon cannot be understood independently of the visual images and designed presentations that convey the content and forms of fashion. With the breakthrough of the digital media in the 2000s we were introduced to new ways of communicating and staging fashion where the blog in particular has established a new media culture for the distribution and exchange of potential fashion-based self-presentation forms and resulted in new design strategies. In this article, the fashion blog is presented as a specific genre that is characterised by remediating existing genre forms and combining them into new formats, where amateur bricolage approaches are combined with the reproduction of familiar features from the established fashion media. The article presents four types of fashion blogs, each representing a specific design strategy for presenting and interacting with fashion content.